Napoleon Bonaparte once commented, "An army moves on its stomach." We might add, so do drum corps. Staff food trucks have become increasingly larger and sophisticated, pumping out meals several times a day that are instantly gobbled up by the voracious appetites of dozens of marchers and staff members. When you take a look at the windows of corps buses, you'll see that members have decorated their personal sanctum with trinkets and other mementos of home. But every once in awhile, a lucky member receives a care package that can't be hung up over their bus seat, but rather, is destined to go straight into their digestive system. 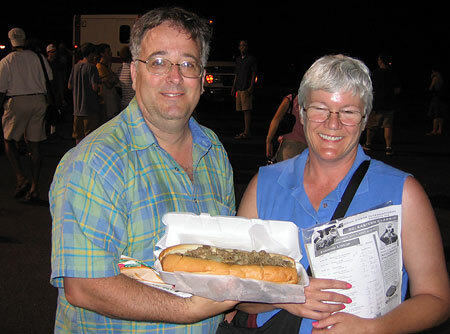 It's not uncommon for members to receive brownies and cookies from home, but one lucky member of the Cadets, Jim Watkins, had a Philadelphia cheese steak sandwich waiting for him as soon as he got out of uniform after the corps' performance in Allentown, Pa.
Parents John and Kathy Watkins brought the sandwich in from Marathon Pizza in their hometown of Drexel Hill, Pa., just west of Philadelphia. Their son, a first-year baritone player in the Cadets, has often claimed to miss hometown food, even though his parents both admit that meals from The Cadets' food truck looks quite good. The parents put the sandwich on ice to help it make the trip to Allentown, giving the sandwich a much longer duration than what it endured once Jim wrapped his teeth around it. His father claims, "The lifespan of the sandwich from when he gets it to when it totally disappears is maybe only four minutes." Mother Kathy says that if Jim wasn't hungry for the sandwich right away, although an unlikely preposition, it would still be good for breakfast the next day. She says the culinary creations are so good because, "you can't get Philadelphia rolls anywhere else in the country. It's chewy on the outside and soft on the inside. It's a hoagie roll, not a submarine roll, holding chip fried steak with melted cheese and friend onions." Granted, in most parts of the country, that distinction would be lost on lesser gourmands of epicurean delights. When asked what Jim would likely say when he saw the sandwich, his parents took turns replying, "He's going to say, 'Let me go eat this. Love you. Good-bye now.'"